And then it’s on to Rnd 12! This is one of my favorite rounds. It represents a special change of heart for me. Anyone who knows me knows that I have a bit of a perfectionist bent. Well, this particular round really taught me to loosen up and have fun. At first I was inclined to write the pattern so that people would have to count all those hdc stitches in Rnd 10 as they went in order to get their “wheel spokes” absolutely positively evenly spaced. But then something inside me said, “Just let loose. This pattern is supposed to be fun.” So that’s what I did. And I’ve been satisfied with the results in every pillow I’ve made. I hope you are able to let loose too and really enjoy this fun round. You Don’t Have to Cut Your Yarn after Each Round! One important thing to note about this pillow front is that you don’t have to cut your yarn at the end of each round if you don’t want to. You can carry it up the back instead. 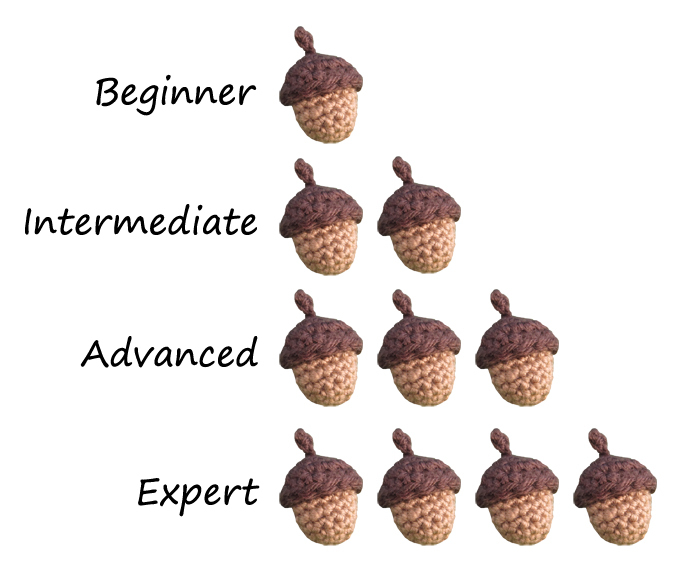 There are advantages and disadvantages to each method in my opinion. When you choose not to cut the yarn after each round, you end up being “tied” to many balls of yarn and you’ll probably have to untangle them now and then to keep them straight. I do this by keeping them in order and always bringing the next color to the front of the line before I start the round. This keeps the colors tidy at the back of your work, which is really just for your own enjoyment (no one will ever see it!). However, if you don’t pull the yarn a little taut when you start using it again, you run the risk of the join being loose later down the line. If you choose to trim your ends each time you change color, you won’t have to worry about anything coming loose because you will weave in your ends before you assemble your pillow. So it really may just be a matter of how much you enjoy or don’t enjoy weaving in ends! With that, let’s begin Rnds 10-13! Here’s another example that might illustrate it more clearly: To begin Rnd 11, you’ll pull up a loop of D and chain 3 more for a total of 4 chains. There are two ways to skip the alternative join stitch: Either hdc into the stitch before the join, sk the alternative join, and hdc in the next stitch of A. Or if you find it hard to get your hook into this last B stitch, skip it and hdc into the A stitch with the alternative join (not into the join itself). To end the round, join with a slst to the first stitch. Be sure not to mistake the chain for the first stitch. In fact, from this point on, it might help you to use a piece of waste yarn to mark the beginning of each round. At the end of Rnd 10, you should have 90 sts. To end the round, join with slst to the first stitch of the round. This is also a good time to talk about working in the round. There are a few schools of thought on where your first and last stitches should go. In the book, I talk about working the first stitch of a round into the next stitch (not the one at the base of the initial chain). The last stitch is worked into the back of the slst join that ended the previous round. I feel that this gives it a more seamless join. This method also means that the initial chain does not count as a stitch. Again it is only used for changing color and achieving the height needed for the stitches in that round. Be sure that you don’t make your slip-stitch joins too tight. You’ll need to be able to work into the back of them at the end of the next round. You can always tighten them after you finish the round by pulling a bit on the working end. Rnds 10-11 not only gave us an opportunity to get on the same page about beginning and ending rounds, but those parts in the middle were pretty nice too. 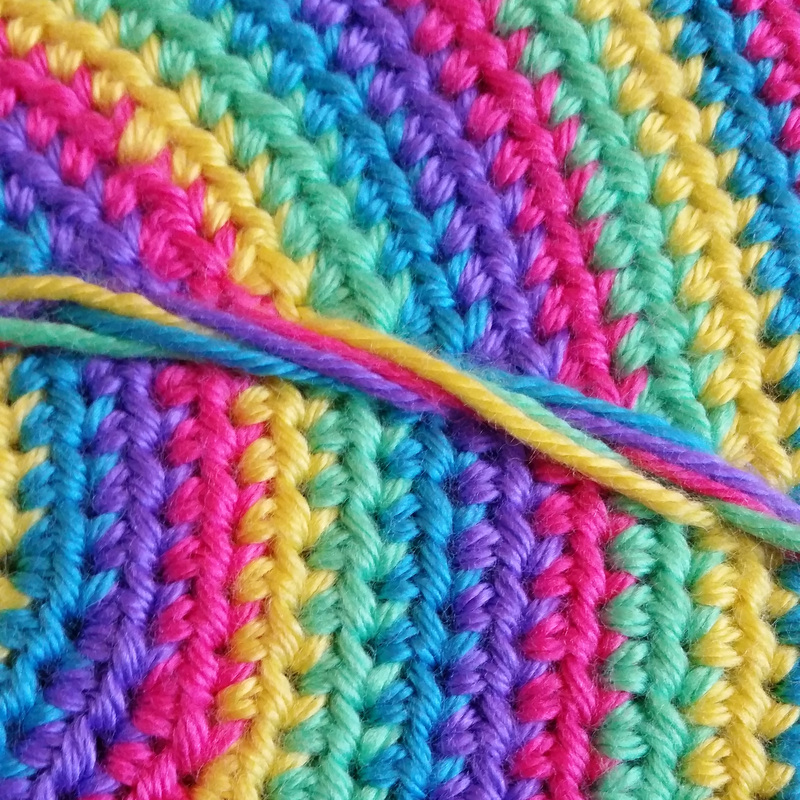 I enjoy easy rounds because they let me zone out and crochet without thinking too hard. They offer a nice change of pace, and they get me relaxed and ready for the more complicated parts. I’m not gonna lie, Rnd 12 is more complicated, but once you get the hang of it, I’m sure you’ll find it a piece of cake. Let’s get started on this exciting round. 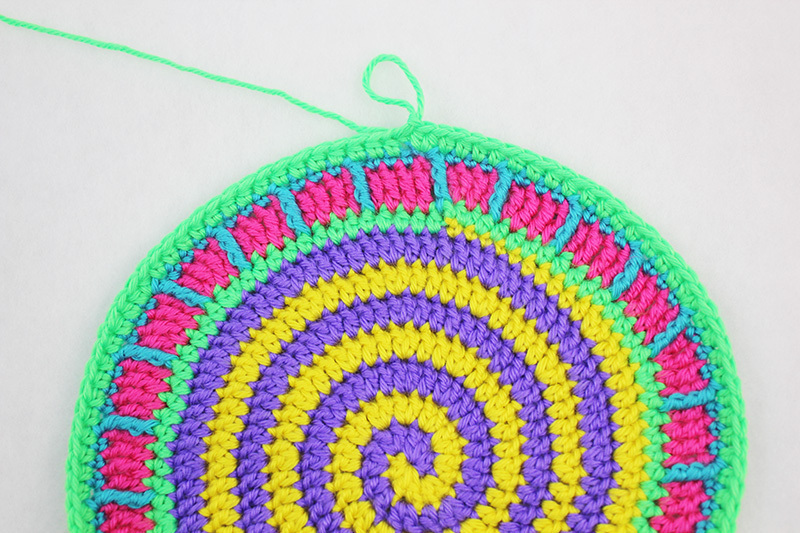 First grab your ball of E yarn and follow the pattern to the first stitch that we will skip. 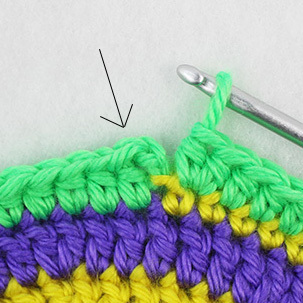 To find the hdc directly below the skipped st, hold your work upright so that the next stitch is at the top. Trace an imaginary line down from this stitch to Rnd 10. This hdc will never be exactly below. Technically it will be either to the left or right of the sk st. Just decide whether you want to work into the hdc before or after the sk st and choose the same way each time. Consistency is key, but keep in mind this is not meant to be exact. It’s much more fun to eyeball it. Whichever stitch you choose, keep your eye on it or hold it between your left thumb and forefinger as you wrap your yarn around your hook three times to begin the dtr. 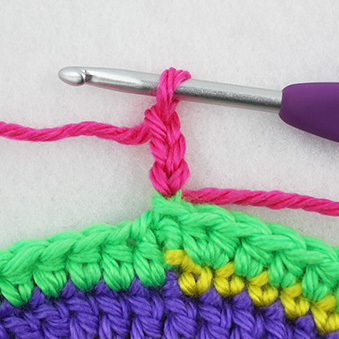 To crochet around the post, insert your hook into the space before the hdc, behind it, and out to the front on the other side. Yo and pull the loop through the st. Yo again and pull it through the first 2 loops on your hook. Yo again and pull it through the next 2 loops. Yo again and pull through the next 2 loops. Yo one more time and pull through the last 2 loops. 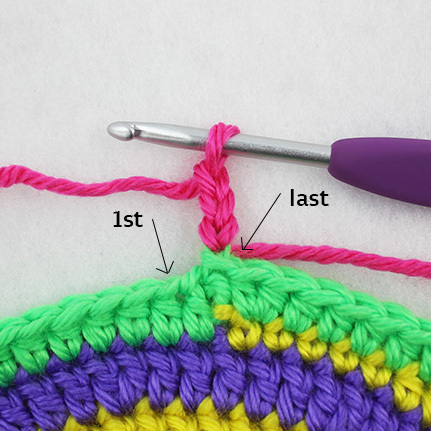 One trick that might help you with double-treble (dtr) crochet stitches is to try to hold the initial 3 yarn overs with your right fingers as you insert your hook and work the first part of the stitch. This will help you “hang on” to those wraps without tightening your gauge. Continue with the pattern to finish the round. I hope you had fun with Rnd 12! Thankfully Rnd 13 is super easy, so enjoy a nice relaxing round. Now is a great time to weave in your ends so far, unless you’d prefer to do them all at the end. See you next time for Rnds 14-19! Categories: Tall 'n' Fast Flower Crochet Along | Tags: crochet, diy, home decor, tall n fast flower CAL, Tall n Fast Flower Pillow | Permalink. Hi Katy! I’m sorry to hear that you had a time with Rnd 12. 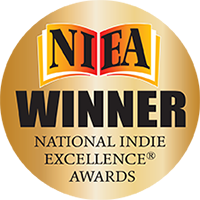 Now you know firsthand how I fretted with that round. It’s a good teacher if you’re willing to listen. It says, “Just go with the flow, man.” 😀 I just remembered seeing yours on Facebook. Great work! I am loving your color combination. And I totally understand and agree with your calling this round “The Ladder.” Climbing out of the spiral–that’s perfect!